This product was added to our catalog on Sunday 11 October, 2015. If you are frustrated with the audio quality of your built- in microphone, this Gloxy GX-M20 Stereo Video Microphone will come in very handy. This new item in the Gloxy serie is a professional whilst affordable microphone and you can use it both on and off camera, whichever works best for you. The Gloxy GX-M20 Stereo Video Microphone is a supercardioid microphone that offers a narrower pickup and filters more ambient sound. The shock mount will isolate any noise that might be picked up by the switches or controls you change on your camera and the Gloxy GX-M20 Stereo Video Microphone connects to your camera with a 3.5 stereo mini-jack plug. Connect the Gloxy Stereo microphone to your VDSLR camera, camcorder, video camera or audio recorder with a 3.5mm stereo connecter. There is a 1/4" screw on the bottom for use on tripods or sliders. If you use this Gloxy GX-M20 Stereo Video Microphone with a Sony camera that use the MIS hot shoe you will need an special adapter that is NOT included in this microphone. Use the Gloxy microphone on your camera or along with any other video accessories such as a steadycam bracket. 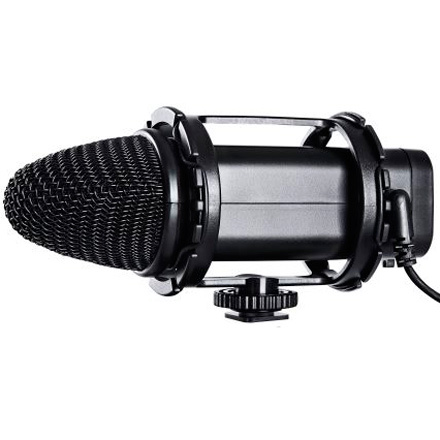 The Gloxy GX-M20 Stereo Video Microphone features a special pair of Cardioid capsules arranged in an X-Y pattern, which makes it the ideal microphone for location or broadcasting recordings. Included Dead Kitten wind shield to cover microphone, user manual, extra elastic bands and a carry pouch.